July 29, 2016 By Aileen 15 Comments This post contains affiliate links. As an Amazon Associate and member of other affiliate programs, I earn from qualifying purchases. Whip up a batch of crispy and flavorful tilapia fish cakes with this easy (and yummy) recipe. Let me start out by saying I am not much of a fish person. I didn’t grow up eating it and was pretty anti-fish as a child & young adult. My husband, however, is a huge fish fan. It’s also really healthy, so I incorporate it into my meal plan every 1-2 weeks. This recipe has helped convert me into a fish eater. 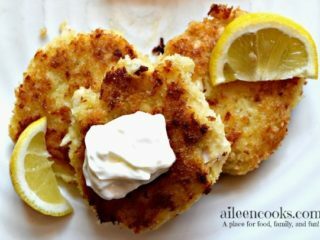 I love this tilapia fish cake recipe because it doesn’t really taste like fish. They are just crispy and delicious. Even my kids would agree. They happily eat fish cakes whenever I make them, which is a great motivator to make them more often. You can easily make this recipe without potato. Just omit it. Everything else stays the same, but your yield will be slightly less. Most fish cake recipes advise you to make this when you have leftover fish from another meal. We don’t usually have leftover fish, but if you do, this recipe is perfect. Also, try this recipe for zucchini fritters if you have leftover zucchini. Otherwise, just salt and pepper your fish and bake it in the oven prior to preparing this recipe. You can do this step the day before and store the cooked fish in the refrigerator. This recipe calls for tilapia, but cod, mahi-mahi, even salmon will work. 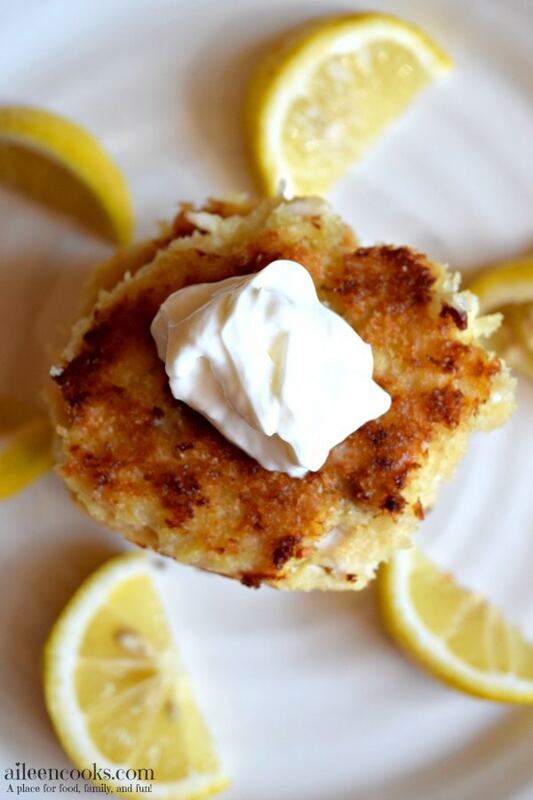 Use what you have on hand and you are sure to enjoy this fish cakes recipe. Fish cakes freeze quite well. You will want to let the cooked tilapia fish cakes cool to room temperature. Flash freeze them and store in a zip-top freezer bag. Be sure to get as much air out as possible (sucking the air out with a straw helps). When you are ready to eat the frozen fish cakes, just reheat them in the oven at 400 degrees for 8-10 minutes. Using two forks, shred the cooked tilapia. In a large bowl, combine the shredded tilapia, 1/2 cup panko breadcrumbs, potato, eggs, sour cream, lemon juice, chili powder, salt, pepper, and cayenne. Mix well. Lay out two large plates. Sprinkle the remaining 1 cup panko breadcrumbs on 1 plate. Using your hands, scoop up a golf ball sized amount of the fish mixture. Roll it into a ball and flatten. Dip it in the panko on both sides and place on the empty plate. Continue with the remainder of the fish mixture. Heat 2-3 tablespoons olive oil in a large skillet over medium heat. Working in batches, arrange your fish cakes in a single layer in the skillet and cook for 3-5 minutes, until golden brown. Flip and cook on the other side. Add more oil, as needed. Cook the remainder of the fish cakes and serve with sour cream. I love whipping up a batch of tilapia fish cakes because I know my kids will love them and they include that healthy fish our bodies need. I haven’t fixed fish cakes in such a long time. Going to change this now. Fish cakes and fresh salad coming up. These look so good! I added to StumbleUpon and saved it! Thanks! 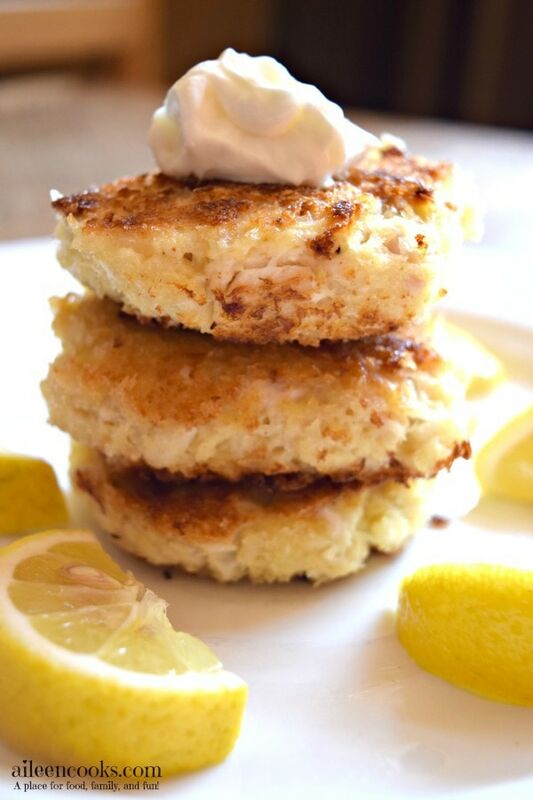 I love crab cakes and these look delicious as well! Will have to try it soon! This looks yummy, and 30 minutes of less is perfect for weeknight dinners! Wow! I love fish and these look AMAZING!!! Oh, these fish cakes look so good and something I know I’d love! Thank you for sharing your recipe! Is the shredded potato cooked or raw? Hi Kristen. The potato is raw.